Tasty combo, hey? Has a nice ring to it anyhow… Went blueberry picking this week at Valentine’s ranch with my friend Donna. We learned that a spring hailstorm had seriously damaged the berry blossoms, so the picking season would be curtailed. Nonetheless, I picked 12 lbs, Donna 17! Yesterday it was time to pull the Elephant Garlic and the “Big Beef” tomato plant in the greenhouse had to be relieved of some fruit. Fortunately I have a friend who loves fried green tomatoes; funny, it never occurred to me that green tomatoes aren’t generally available commercially — ya gotta know someone! I was gathering greens + flowers today, adding to Mother’s Grocery delivery, and came across a Pacific tree frog in the blackberry bramble (our freezer berry supply). Not sure if it’s a thimbleberry or a salmonberry providing a perch, but FYI…their greens last a LONG time in flower arrangements. This frog IS little, maybe half-grown; there’s an ample supply of spiders, fly-bys and creepies to hunt here, but he/she also runs the risk of froggy-eating birds that may come along. Don’t miss Mother’s when you visit Bandon! For you cyclists out there, it’s a convenient spot to stock up, grab a meal in the deli, and just a few doors away is South Coast Bicycles. =sigh= For freshness’ sake, I decided to postpone veggie delivery ’til next week — the roses a bit paltry too — but I thank our 14 y/o senior citizen, Orphan Annie, for posing (sort of) in the background. After a cool, wet Spring, peppers started from seed are FINALLY starting to thrive; 140+ plants, 25 varieties. 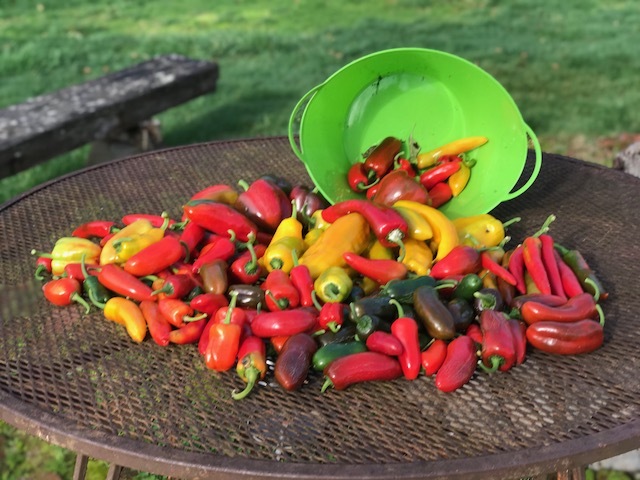 I confess to purchasing a few, just to make sure SOME peppers come off before August! Meanwhile, the 11 olive trees are fruiting like crazy — maybe they liked the cool, wet Spring?